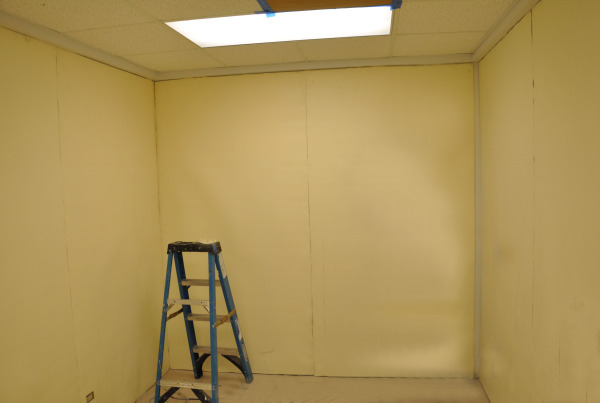 Acoustiblok Wallcover was installed in a classroom on the HCC campus, converting the room to a soundproof recording studio without removing drywall. Acoustiblok Wallcover was installed directly on top of the existing drywall, making it a no-construction soundproofing project that was completed in two days. TAMPA, Florida, September 12, 2011 – Faced with the need to create a soundproof environment for sensitive audio and video recording projects, officials at Hillsborough Community College’s Corporate Training Center on Davis Islands transformed a small classroom into a soundproof recording studio by installing Acoustiblok Wallcover® on top of the existing drywall. The HCC recording studio, which took less than two days to complete, marked the first-ever commercial application of Acoustiblok-Wallcover. Acoustiblok-Wallcover is the first scientifically designed noise reduction solution available that is applied directly on top of existing wall surfaces (including concrete). It installs easily with adhesive spray and requires just two or three people to align and hang it properly, making it a perfect DIY project for silencing any room. Years in the making, Acoustiblok Wallcover incorporates a unique aerospace nanotechnology laminate which provides the acoustical breakthrough needed for this type of application. The recording room is used for creating e-learning materials for the Hillsborough Community College faculty and staff, according to HCC Technical Specialist Steve Barry. 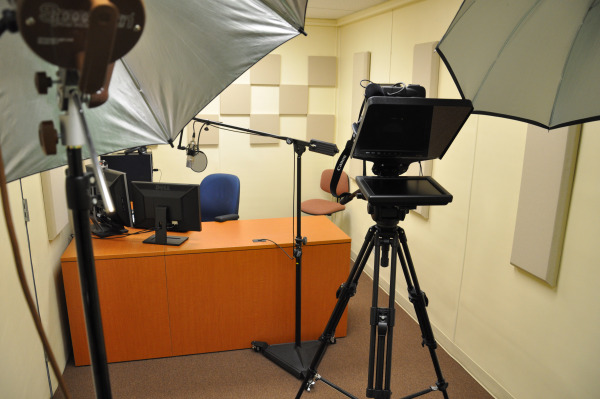 “We record video and audio, and create multimedia components to use in lessons,” Barry said. The equipment is also used to conduct live webinars for the HCC community and for open-enrollment students. 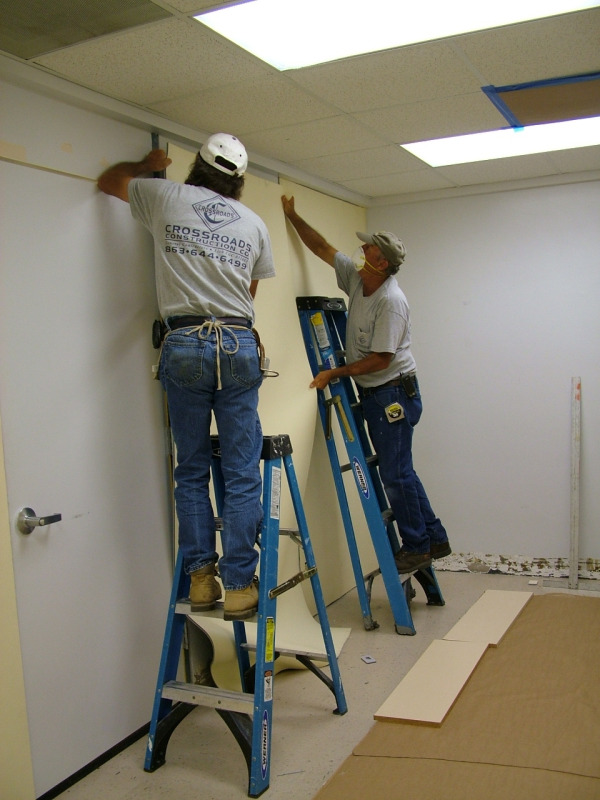 Two HCC maintenance staff members attached the Acoustiblok Wallcover material to the room’s four walls using spray adhesive. A simple box cutter was used to create cutouts for electrical sockets and light switch panels. Each section was aligned directly to each other, with one installer working from the top and one from the bottom to align and press the material securely to the wall. Acoustiblok-Wallcover’s silver fabric finish was painted a pale yellow, rendering the noise barrier material undetectable. HCC was the first to install Acoustiblok-Wallcover, an option that spared them the expense and mess of removing the existing drywall to attach Acoustiblok’s traditional 3mm noise abatement material directly to the studs, which would have required hanging new drywall, and time-consuming permitting and bureaucratic red tape. Barry said that once the trim and caulking was completed, a coat of paint gave the room the polished look that they were after. Before installing the Acoustiblok Wallcover, Acoustiblok’s standard 3mm sound abatement material was installed in the room’s ceiling to block noise from above, creating the serious level of soundproofing necessary for recording. Lahnie Johnson, president and founder of Acoustiblok, Inc., says the application of Acoustiblok-Wallcover in the HCC sound room, and the standard 3mm Acoustiblok material laid inside the ceiling tiles provides a perfect example for achieving substantial results with minimal skilled labor and investment. 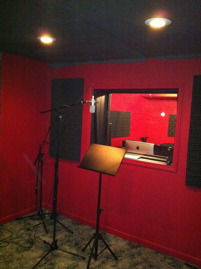 “We are happy to help colleges and universities achieve successful soundproofing in projects like this one at HCC, and are thrilled that our new Acoustiblok Wallcover provided the sound barrier they needed for this recording studio, without any need to tear out walls or hire additional contractors,” Johnson said. Acoustiblok Wallcover’s flexible material measures approximately ¼-inch thick, and is available in 4-foot by 8-foot and 4-foot by 10-foot sections. Weighing about one pound per square foot, Acoustiblok-Wallcover is fairly heavy, which is why it takes two or three people to install. A simple box cutter is all that is needed to create cutouts for electric sockets and light switch panels. Recent certified laboratory tests have proven that adding just one layer of Acoustiblok-Wallcover to one side of a wall resulted in a sound transmission classification (STC) of 53, providing more noise reduction than 12-inches of poured concrete (STC 51). Acoustiblok is recognized and sold worldwide, earning product awards from the British House of Commons, and was named Builder News Magazine’s Product of the Year. The company’s use of aerogel technology in its Thermablok insulating strips earned recognition in NASA’s Spin-off prodcts Magazine. 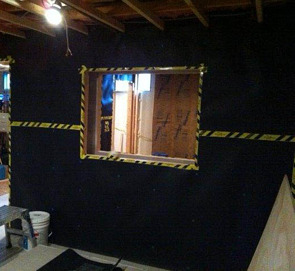 For more information on Acoustiblok-Wallcover, or to view a video demonstration of Acoustiblok’s sound deadening capabilities, visit the website at www.acoustiblok.com, call 813.980.1400, or email sales@acoustiblok.com.